Naturally the president’s not-so-little indiscretion has generated plenty of debate on not just the myopic nature of the statement, but the appropriateness of it, particularly in view of the fact he was standing next to the first citizen of another country who just happened to be a woman at the time. The truth is that finding the right words to answer questions has never been a strong suit of Buhari. Interestingly, it was in the same Germany he referred to the Chancellor as President Michelle, instead of Chancellor Merkel, and also “renamed” the European country West Germany (a name it has ceased to be called since 1990, instead of Germany) during the G7 Summit last year. Maybe there’s just something about the Western European nation that unsettles our president. But then again, when one considers the other gaffes he has committed, especially in the international media, one is tempted to ask if Mr President feels slightly intimidated in that space. One thing is certain though, this latest blunder trumps the rest. For one, it’s sad that in spite of all the talks and advocacy for gender equality and women empowerment, the one person that should champion the cause in this age and time appears to still view women as not being necessarily useful beyond the domestic front – an ephemeral, infinitesimal factor in the grand scheme of things. A woman who was up and doing during your presidential campaign, mobilized other women, held town hall meetings and stood by you during the arduous process of electioneering suddenly doesn’t belong to any party, and belongs only to three spaces in your home? I played the devil’s advocate in my discussion with other people concerning the matter. The president meant it as a joke I reckoned, the chuckle just before he gave his response suggested that. But, like the bad joke that it turned out to be, it came out flat. The punchline was lost on many people. Though Garba Shehu, the Senior Special Assistant to the President on Media and Publicity tried to make Nigerians see the funny side of things, and a couple of people have written articles defending Buhari by pointing out that he supported his wife to become the Masters degree holder that she is today, the damage was already done. While I personally disapprove of Aisha Buhari’s public criticism of her husband, his reaction to the situation as someone who is much older (and supposedly wiser) and holds a far more important position than his wife leaves plenty to be desired. And to make matters worse, he has refused to admit his mistake, insisting that he meant what he said. Nevertheless, President Buhari and his leading lady will be fine. They have been married for 27 years and I’d like to believe it’s fairly safe to assume they understand each other well enough to weather this embarrassing public spat. The effect of Buhari’s words on the rest of us, especially young men and women who are new in marriage or planning to get married is what worries me. It makes little sense that in 2016 we still have to debate who really belongs in the kitchen. But, that’s obviously where we have found ourselves. And considering that this issue has been controversial over time, particularly on social media, it only means it won’t go away until it is properly addressed. While most of our parents and grandparents believe the kitchen is strictly the purview of the woman, that notion or way of life is increasingly becoming a thing of the past. And for good reason too. Nowadays, things are far tougher than they used to be many years ago. Even when a couple have a means of livelihood, sustaining the home financially remains a day-to-day struggle for them. The current economic recession hasn’t helped matters either. More than ever before every kobo counts to majority of the populace who are striving to keep their heads above water. Far gone are the days when the man takes up paid employment or runs a business to cater to the home solely, while the woman concentrates on house-keeping which of course includes the preparation of meals. These days, more and more women hold executive positions in their places of work because they have to contribute to the upkeep of the home. It’s not even uncommon to find women as breadwinners in many homes, no thanks to job losses and the economic downturn. This invariably means that the dynamics of the home has changed. It then begs the question, if the woman can contribute financially to the sustenance of the home, what stops the man from taking up a task as mundane as cooking sometimes? 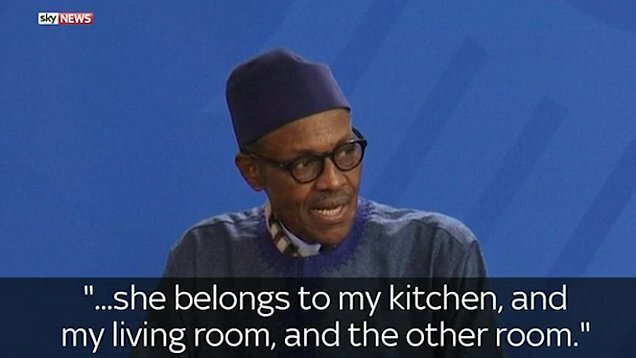 Even before the Buhari’s “Kitchengate” happened, the issue of cooking has always generated plenty of debate on and off social media. To cut to the chase – anyone who has the ability to be hungry belongs in the kitchen. At the risk of contradicting myself, as much as cooking may be seen as an ordinary task which doesn’t rank close to life saving vocations like discovering the cure for cancer, it’s also important. As important as life itself because it has to do food which no one can do without. Again, apart from the fact that a relationship should be a partnership of equals who respect and value each other, to depend solely on another for one’s survival is foolhardy. It’s the reason women in particular have a duty to teach their sons how to cook. It’s pertinent if we must ensure that the next generation of young men never ever grow up with the archaic mentality that they have no business in the kitchen. It’s not enough to huff and puff on Facebook and Twitter, and scream marginalization. Bottom line is, no particular gender belongs in the kitchen, and both genders belong in the kitchen. Did someone just ask who belongs in the other room? I’ll get back to you on that when I consult with Mr President. I differ a bit on this, sister. I think the woman put things in a tight spot with her open criticism, and that the President was making light of the situation by brushing aside what she said. The mere fact that she had the liberty to make her statement openly refutes the possibility that she is a repressed or relegated woman. Also, knowing their history, the fact that she was just 18 when she married him, and has achieved so much in spite of that, shows that he allows her to be and do as Aisha pleases. She gaffed & I think he just tried to make light of it. I posited as much in the article. I mentioned that I disagreed with her open criticism of her husband, and that I also believe the president tried to make light of the situation. However, how does one defend the fact that even when he was asked in a separate interview afterwards, he maintained his earlier statement. Could he have been joking a second time? I certainly agree that Mrs Buhari is far from being a caged woman though. As I type this she’s probably making a speech in Brussels. Thanks for the contribution sis. The feminist will disagree with me but a woman needs a man and vice versa. Woman are home managers and not slaves. I give kudos to the women because their way of managing things is second to none. A man has his power so does the woman, Rather than debate on who has a role to play in the home or family, I think they should both support each other for the sake of peace and harmony rather than play the blame game. As for Mr president and Madam First Lady, let us leave them alone. Is part of the love. Everything will be buried once they enter ‘the other room.’ Lol. ???? The twists and turns of this one makes it a bit difficult to drop opinions as it may be misconstrued. Nevertheless, I dare to say I stand with PMB on this one based on the CONTEXT in which I think he made the statement. The timing and venue especially is what I think was quite inappropriate. In the capacity of a “wife”, she is no politician and if she was to air her views on his administration of the nation in that same capacity, it should not be in the public space and or the manner in which she did it! Likewise if it was vice versa i.e. in his capacity as her husband, he is no president. I think the president was just emphasising the distinction between their private lives as a married couple and him being the president. I do not think the intent was to relegate or downplay the “usefulness” or “relevance” of a woman. He however really needs to be careful with his utterances in the public space especially in the international scene as these may be very easily be misconstrued. I agree that Buhari meant it as a joke. Aisha certainly doesn’t come across as a woman who isn’t liberated. I only feel that he should have tried to make the interviewer and by extension the general populace understand this when he was asked to further clear the air.